And, as ever, the economic outlook is uncertain, and so monetary policy is not on a preset course. 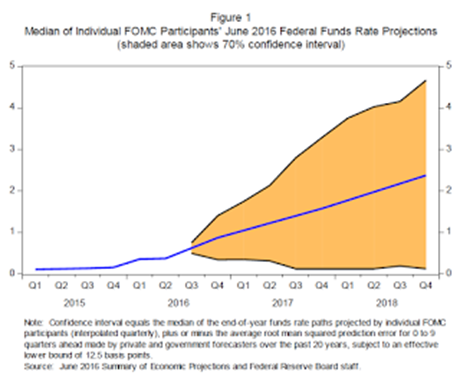 Our ability to predict how the federal funds rate will evolve over time is quite limited because monetary policy will need to respond to whatever disturbances may buffet the economy. In addition, the level of short-term interest rates consistent with the dual mandate varies over time in response to shifts in underlying economic conditions that are often evident only in hindsight. The reason for the wide range is that the economy is frequently buffeted by shocks and thus rarely evolves as predicted. When shocks occur and the economic outlook changes, monetary policy needs to adjust. What we do know, however, is that we want a policy toolkit that will allow us to respond to a wide range of possible conditions. The range of reasonably likely outcomes for the FF rate is so wide it´s useless. One property NGDP targeting (in fact NGDP LEVEL Targeting) is that it is the appropriate framework for “all seasons”, i.e. you don´t need to keep tinkering with monetary policy. In addition to keeping the central bank from mishandling supply shocks, it keeps the central bank from generating demand shocks, which throws both inflation and real growth in the same direction, up as during the “Great Inflation” and down as in the “Great Recession”. Independent of Brexit, the bigger issue remains that all three currency blocs – USD, Euro and British Pound – are seeing low NGDP growth, too low for comfort. 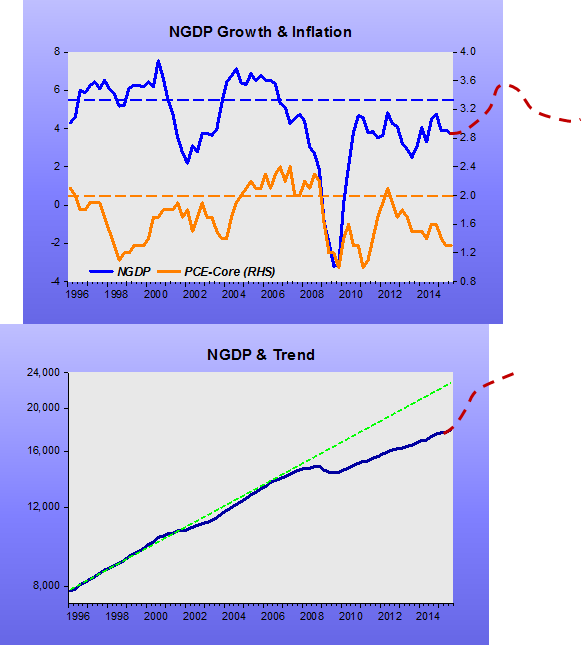 Small real shocks like Brexit (let´s call them, à la Robert Higgs, actual and/or potential institutional discontinuities) cause market mayhem precisely because NGDP growth is too low and thus rather fragile and easily knocked lower. Why is NGDP level and growth so low? Because central banks seem to like it that way. Their 2% inflation targets dominate their discourse and all their internal projections show them on course to meet their targets in two years’ time – and to hell with NGDP growth. The result is slow monetary strangulation; Brexit is mere noise in this bigger picture. Nevertheless, given the nature of Brexit, that mixes Supply and Demand shocks, some clarification is in order. Brexit caused a (less global) fall in trend real growth (AS shock). Given that monetary policy is synonimous with interest rate policy, this requires a fall in interest rate (because the neutral rate has fallen), which at the ZLB is not forthcoming. In that case, a negative AS shock automatically turns into a negative AD shock. 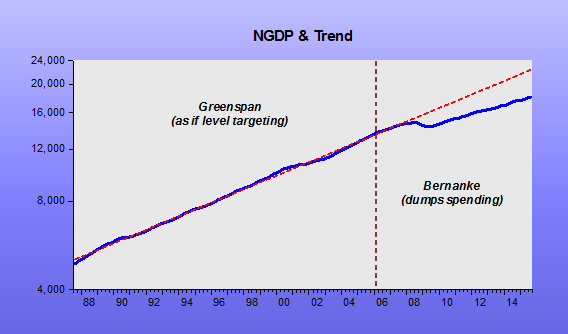 If the negative AS shock is permanent, for nominal stability to be maintained you require a lower trend growth in NGDP. Permanent AS shocks tend to be rare! Suppose, for example, that the Bank of Japan had announced a target of 4 percent in March 2013. Actual inflation over the past three years would probably have been higher — teaching wage-setters and price-setters that if they want to avoid costly mistakes, they’d better pay attention to what the central bank says will happen. Having built up that credibility, the central bank could then more easily guide expectations to its long-run goal of 2 percent. Before Abe, Japan had an implicit 0% inflation target. By establishing an explicit 2% target, things should have worked out as Kocherlakota argues. But they didn´t! Does that mean that if you really want 2% inflation you should target 4%? Doesn´t sound reasonable. 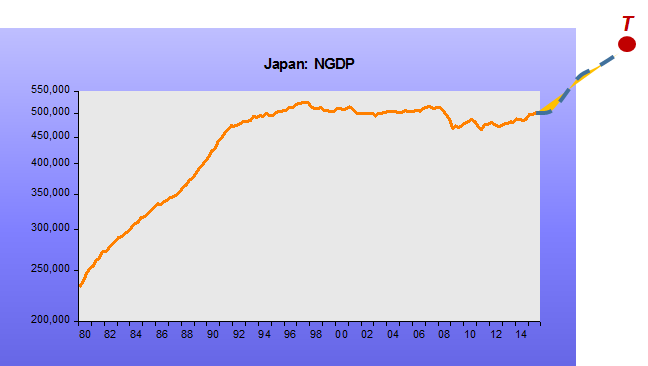 As the chart indicates, Japan´s problems began when the BoJ allowed NGDP to stagnate. It appears it would be much more effective for Abe/Kuroda to stipulate that the BoJ would “not rest” until nominal spending (NGDP) had reached the stated level, from which it would henceforth grow at a specified rate. Why has r* fallen so much and stayed so low, despite signs of improvement in the economy? One reason is the diminished credibility of central bank objectives. The Fed (and other central banks) have fallen short of their inflation and employment goals for many years, and are expected to do so for several more years to come. The public’s beliefs about Fed long-run capabilities and objectives are evolving in response to these misses. It should not be surprising that the Fed’s extended misses with respect to its objectives are fueling expectations of similar future extended misses – and are one factor that is pushing down on r*. This analysis seems like yet another argument against the plan to continue to tighten monetary policy. Doing so only serves to prolong the Fed’s long undershoot with respect to inflation and (more arguably) with respect to employment. The additional erosion of credibility will create still more downward pressure on r*. (Note: r* stands for the neutral rate of interest). On Twitter last night, commenting on Stanley Fischer’s contribution to a panel at the American Economic Association meetings in San Francisco, outgoing FOMC member Kocherlakota expressed his scepticism about the wisdom of raising the inflation target. However, credibility worriers also need to remember [and here I don’t finger Prof Kocherlakota for failing to] that in some respects raising the inflation target may improve the credibility of monetary policy and reduce inflation uncertainty. By persisting with the current 2 per cent target, the Fed and other central banks risk further long episodes at the zero bound, and further protracted periods in which inflation is substantially below target [in the UK headline inflation has been about 0 for a year now], and corresponding uncertainty about whether the central bank can ever regain control over inflation. If setting a higher target means reduced time at the zero bound, then it most surely means better inflation control, and enhanced ‘credibility’, in the sense of the reputation for competence and inflation forecasts that would follow from inflation turning out to be closer to the new, higher objective. Nowhere does Kocherlakota mention a higher inflation target. That´s TY´s pet project. In any case, if the Fed does not seem to be able to hit the 2% target, how can we presume a 4% target is not only achievable but also enhances credibility! Inflation is determined by monetary policy. 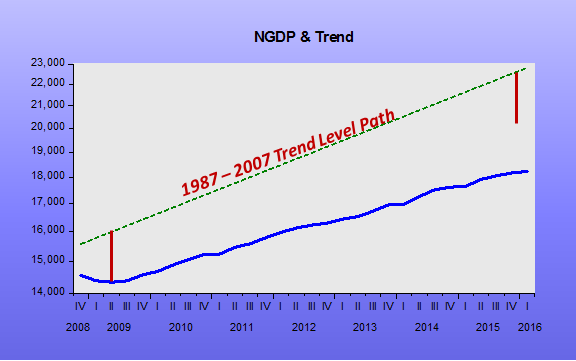 If instead of associating monetary policy with interest rate policy (which becomes “ineffectual” at the ZLB) you associate monetary policy with NGDP growth relative to a stable trend path, you get nominal stability. In that case you not only avoid the ZLB but you get stable (and credible) inflation and stable RGDP growth. Over more than 20 years prior to 2008, the Fed succeeded in obtaining nominal stability. 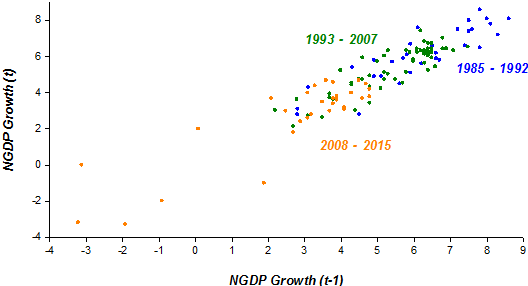 That comes out clearly in the chart below where, particularly between 1993 and 2007 NGDP growth is quite stable (low growth dispersion). 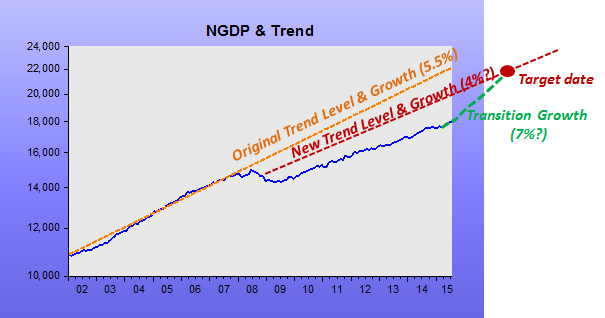 That stability (around a trend growth path) was lost in 2008 and the appropriate level path has not been regained. Core inflation, which particularly during the 1993 – 2007 period had remained close to 2%, fluctuating due to real (productivity) shocks, since 2008 has mostly been below the 2% target. Just like the 1970s showed that a rising NGDP growth path is inflationary, the last several years have shown that too little inflation results from too low NGDP growth (at a low trend path). What that tells me is that it is high time to stop talking and worry about inflation and try to regain the lost nominal stability that the US economy enjoyed prior to 2008. Best way to achieve that is for the Fed to set an NGDP Level Target. Thirty years ago, any policy maker would have welcomed a run of inflation below 2 percent. But the less inflation there is, the lower central-bank rates will be, making a return trip to zero more likely. That would force officials to resort, once again, to unconventional tools such as bond-buying that can be politically unpopular and less effective in restoring jobs and growth. 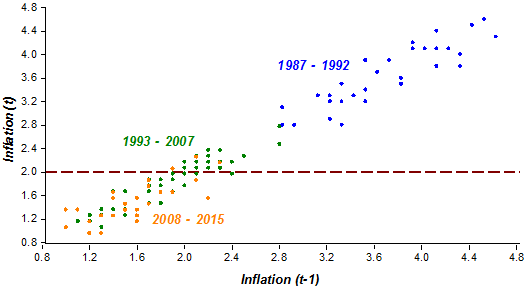 1 There´s not much difference in the behavior of inflation in 1996-04 and 2010-15. In both instances they were mostly below “target”. But no one worried about “too low” inflation 10 or 20 years ago! And as the charts also indicate, that´s a job the Fed can do if it sets its mind to! There is a great escutcheon carried by the tight-money crowd, that actions taken by central banks have “long and variable lags.” Behind this shield, the tighties always see inflation as a threat on the horizon, and thus always central banks should be tighter. As no one can with certainty project prices two years out, there is always a measure of plausibility in “inflationary threats,” and thus always a case for tightening. So, let’s look back two years. 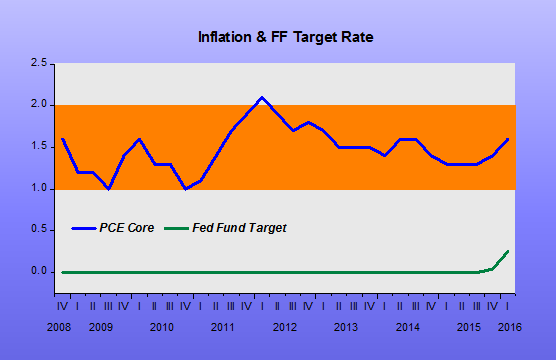 Then, as now, the U.S. Federal Reserve had an inflation target of 2% on the PCE deflator, and that is an average. On paper, the Fed should be targeting inflation in the 1.5% to 2.5% range. So what did the Federal Open Market Committee say two years ago—that is, a long and variable lag ago—about inflation? At that time the Fed was engaged in quantitative easing. But the Fed announced it would scale back QE, known as tapering, the start of tightening up monetary policy. Yes, the Fed was below IT, but it would tighten policy. “Beginning in January, the Committee will add to its holdings of agency mortgage-backed securities at a pace of $35 billion per month rather than $40 billion per month, and will add to its holdings of longer-term Treasury securities at a pace of $40 billion per month rather than $45 billion per month.” Of course, the Fed phased out QE in October 2014. The Fed undershot its IT. The PCE deflator as of September 2015 is running at 0.2% above year ago levels, and 1.3% on the PCE core. However, both PCE measures include housing, the supply of which is restricted at local levels through property zoning. Thanks to insights of blogger Kevin Erdmann and others, a very game question is how a central bank can keep inflation (as measured) at microscopic levels and yet support robust growth. It may be a null set. The Fed is presently predicting 2% PCE inflation will be obtained in 2018. And yet at any gathering of central bankers, we see Topic A through Topic Z is inflation—as we saw at the recent Jackson Hole confab, in which six panels addressed the topic of inflation. There were no other panels. It was literally a monomania. The far more important topic or how to support robust economic growth is still off the central banker agenda. The Fed remains unable to adjust to the modern economy, or to migrate to nominal GDP level targeting as a good policy choice. Even an IT band, say of 2% to 3%, is a bridge too far for the ossified Fed. Ever fearful of inflationary boogiemen hiding in thickets of long and variable lags, the Fed suffocates the national economy. For Americans, the timid, dithering Fed translates into trillions of dollars of lost output every year, and greater political support for non-market safety valves for employees and others. Getting smart. Second step: Accelerate the process! …The natural rate of interest is the real, or inflation-adjusted, interest rate that is consistent with an economy at full employment and with stable inflation. If the real interest rate is above (below) the natural rate then monetary conditions are tight (loose) and are likely to lead to underutilization (overutilization) of resources and inflation below (above) its target. … This Letter suggests that the natural rate of interest is expected to remain below its long-run level for some time. This implies that low interest rates over the next few years are consistent with the most efficient use of resources and stable inflation. The analysis also finds that the output gap is expected to remain negative even after the natural rate is close to its long-run level. Additionally, there is considerable uncertainty about both the short-run dynamics as well as what level should be expected in the longer run. All these considerations reinforce the possibility that interest rate normalization will be very gradual. Want to accelerate the process, instead of “waiting for Godot”? Either introduce negative IOR or, better, do level targeting, like a Nominal Spending Target Level. After all, the Fed has for more than 20 years “chosen” the level and growth rate of nominal spending. In 2008 it made a big error, but since than it has pretty much chosen the level and growth rate. By choosing a new trend level and “target date”, it would define the transitional growth.